Macaroons have been popping up in the the end caps and special displays of the grocery store lately. This unleavened cookie is traditionally eaten for Passover, just around the corner. Seeing these fluffy little snowballs everywhere got me to craving them. This version is made with three different types of ginger, and is dipped in dark chocolate. Dipping things in chocolate is the best. I used a 70% dark chocolate bar, but you could also use bittersweet chocolate chips, or whatever chocolate you prefer. These are not very sweet, but the chocolate and candied ginger give them just enough sweetness. 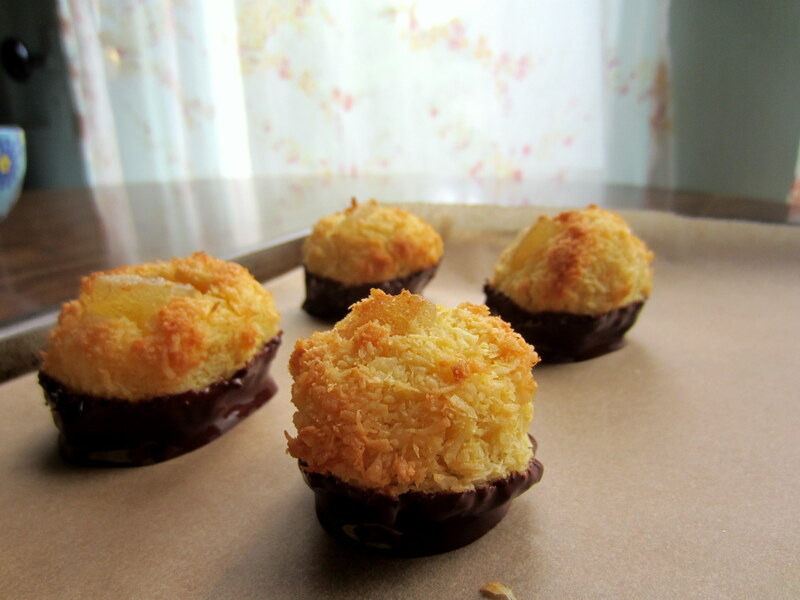 Macaroons are dairy and wheat free by their nature. They are typically made with egg whites, but it seems like a waste to throw out what is truly the best-tasting and most-nutritious part of the egg (the yolk) so these are made with the whole egg. This gives them a lovely tinge of gold. These are very good served with tea or coffee.